The advent of small, affordable ultrasound machines and the widespread use of PACS systems have made imaging more accessible to anaesthetists and intensivists than ever before. This concise, highly illustrated text discusses the key aspects of radiology, examining all imaging modalities and body regions. Introductory sections review the imaging knowledge required for the FRCA exams and the role of imaging in the Pre-Operative Assessment. These are followed by chapters on each imaging modality and body region, each containing numerous illustrations, practical advice on diagnosis, and many case illustrations. Each modality chapter contains a concise introductory section on the principles of image formation. 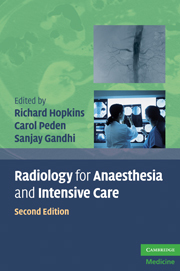 Containing over 300 scans and illustrations, and written by a multidisciplinary team of radiologists and anaesthetists, Radiology for Anaesthesia and Intensive Care, second edition, is an invaluable aid for all anaesthetists and intensivists. Contributors; Introduction; About the FRCA examination; The pre-operative assessment; 1. Imaging the chest; 2. Imaging the abdomen; 3. Trauma radiology; 4. The cervical spine; 5. CT head; 6. Anaesthesia in the radiology department. MRI and interventional radiology; 7. Ultrasound; Index.